Admiral Fitzroy (1805-1865), as commander of HMS Beagle, participated in the Darwin Expedition from 1834-1836. One type of barometer used by Fitzroy was a storm glass. Observing the liquid in the storm glass was supposed to indicate changes in the weather. If the liquid in the glass was clear, the weather would be bright and clear. If the liquid was cloudy, the weather would be cloudy as well, perhaps with precipitation. If there were small dots in the liquid, humid or foggy weather could be expected. A cloudy glass with small stars indicated thunderstorms. If the liquid contained small stars on sunny winter days, then snow was coming. 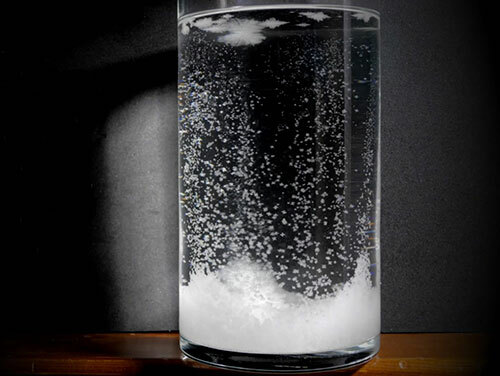 If there were large flakes throughout the liquid, it would be overcast in temperate seasons or snowy in the winter. Crystals at the bottom indicated frost. Threads near the top meant it would be windy.